Casa Riverwalk offers a spacious and well-appointed townhouse with gorgeous views of Mount Mansfield and Luce Hill. The townhouse features a convenient location off of Mountain Road, less than 10 minutes from Stowe Mountain Resort, Stowe Village and Trapp Family Lodge. The Stowe Rec path and many restaurants are only minutes away. A wonderful space for family and friends to get together for the perfect winter or summer vacation. The townhouse features a well-equipped kitchen including a gas cook-top/oven, microwave oven, granite counter-tops, and Bosch dishwasher. The dining room table seats 8 and has wonderful views of Luce Hill. The three master suites include private bathrooms and gas fireplaces. Additional sleeping space is available in the finished basement which includes a bunk bed, a queen bed, and a full bathroom. Other features include an outside hot tub with a Mount Mansfield view, washer/dryer, high-speed Internet with Wi-Fi access, HDTV with cable and a Blu-ray player, and a gas fireplace in the living room. This Lindel Cedar house is exceptionally well built, beautiful and comfortable. The views of Mt. Mansfield, the soaring ceilings and the cozy fireplaces made this place irresistable to us. And we hope you'll share our feeling. Gas fireplaces in every bedroom and living room. Salt, pepper, olive oil, vinegar, spices, sugar. Cook's kitchen with great appliances and cookware. plenty of room for all 8 of us. Lovely bathrooms, and comfy beds. My family just returned from a 5 night stay at Casa Riverwalk. We loved everything about it! Great location, beautiful view of the ski resort, well equipped kitchen, spacious bedrooms...I would highly recommend this house for your Stowe vacation! We absolutely loved our time at Casa Riverwalk. We, three adult couples, spend a long weekend in Stowe every year, and this is, by far, our favorite place to stay. The location is great, right in the middle of Mountain Road, so it's a quick drive to the mountain or out for dinner. Each couple has their own bedroom and bathroom for privacy, but the main living area is perfect for us to gather. We ski all day so we're usually exhausted when we get back to the townhouse, and the hot tub is a welcome comfort. We really appreciated having use of the garage to store our skis at night, and the mudroom is large enough to air out all our ski clothes, plus the additional bonus of not having to clutter up our living area with all that gear! We didn't cook much while we were there, but the kitchen is very well stocked with every amenity and appliance one could ask for. We can't wait to go back next year! Casa Riverwalk is wonderful with a beautiful view of the mountain . It is centrally located and a very comfortable home. The kitchen is well stocked if you choose to cook and every bedroom has a cozy fireplace . I would highly recommend Casa Riverwalk if you are looking for a place to stay in Stowe. Thank you, Faina, for saving the peak colors for our weekend getaway. The gondola ride and lunch at Cliff House were very special. Our party enjoyed the nearby bike trail. We were less than 10 minutes from the Von Trapp Lodge where we had an amazing dinner the eve before leaving. All in all, one of our favorite fall getaways. Our stay at Casa Riverwalk was certainly memorable for our family retreat. The kitchen was perfectly appointed, everything we needed as we took turns cooking a meal and breakfasts. The beds were comfortable and we each had our own 'space' which made for a relaxing retreat. The only thing lacking was a patio on which to idle away the time on the beautiful Stowe evenings. Thank you for a wonderful place to spend time together. 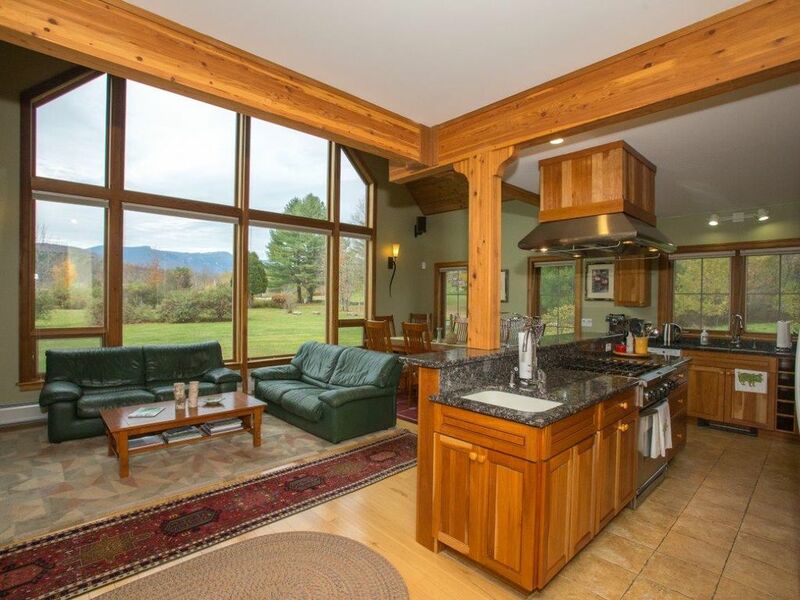 Casa Riverwalk features a convenient location off of Mountain Road less than 10 minutes from Stowe Mountain Resort, Stowe Village, and Trapp Family Lodge. The Stowe Rec path and many restaurants are only minutes away. The property is sited next to West Branch Little River and looks out towards Mount Mansfield and Luce Hill.